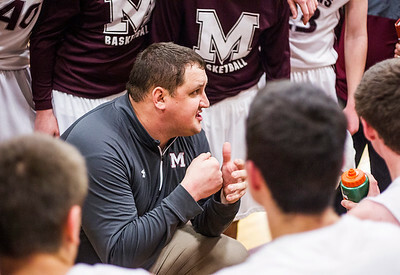 Kyle Grillot - kgrillot@shawmedia.com Marengo's head coach Nate Wright talks with his players during a time out in the fourth quarter of the BNC East boys basketball game Tuesday, January 27, 2015 at Marengo High School. Marengo won, 62-47. 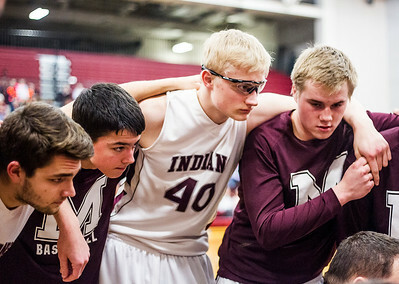 Kyle Grillot - kgrillot@shawmedia.com Marengo players listen as head coach Chad Olson talks during a time out in the fourth quarter of the BNC East boys basketball game Tuesday, January 27, 2015 at Marengo High School. Marengo won, 62-47. 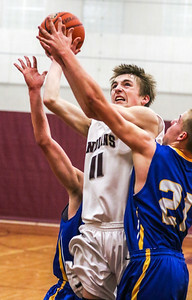 Kyle Grillot - kgrillot@shawmedia.com Marengo's Michael Volkening puts up a shot defended by Johnsburg's Tanner Kreasig (left) and Joe Bein during the fourth quarter of the BNC East boys basketball game Tuesday, January 27, 2015 at Marengo High School. Marengo won, 62-47. 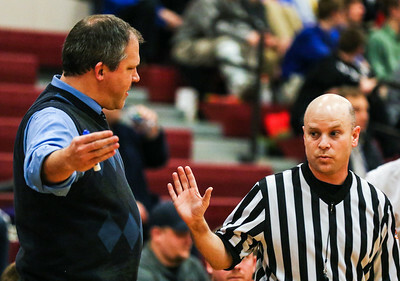 Kyle Grillot - kgrillot@shawmedia.com Johnsburg's head coach Mike Toussaint (left) talks with players talks with an official during a break in the action of the fourth quarter during the BNC East boys basketball game Tuesday, January 27, 2015 at Marengo High School. Marengo won, 62-47. 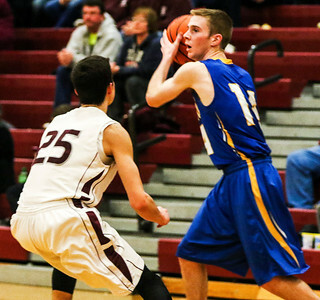 Kyle Grillot - kgrillot@shawmedia.com Johnsburg's Connor Diedrich reacts after the fourth quarter of the BNC East boys basketball game Tuesday, January 27, 2015 at Marengo High School. Marengo won, 62-47. 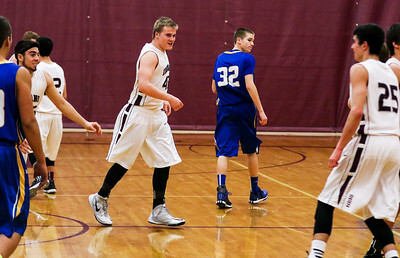 Kyle Grillot - kgrillot@shawmedia.com Marengo's Colton Wightman (center left) and Johnsburg's Connor Diedrich react after the fourth quarter of the BNC East boys basketball game Tuesday, January 27, 2015 at Marengo High School. Marengo won, 62-47. 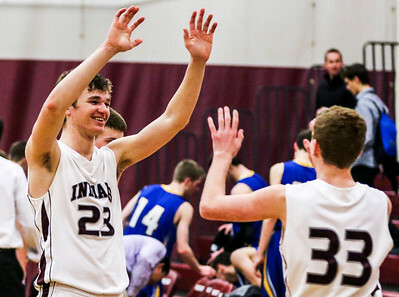 Kyle Grillot - kgrillot@shawmedia.com Marengo's Hunter Simonini (left) celebrates with Trevor Nelsen after the fourth quarter of the BNC East boys basketball game against Johnsburg Tuesday, January 27, 2015 at Marengo High School. Marengo won, 62-47. Kyle Grillot - kgrillot@shawmedia.com Marengo's Weston Shepard (left) dribbles towards the net defended by Johnsburg's Luke Lobermeier during the fourth quarter of the BNC East boys basketball game Tuesday, January 27, 2015 at Marengo High School. Marengo won, 62-47. 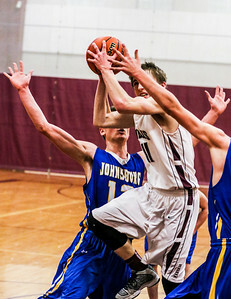 Kyle Grillot - kgrillot@shawmedia.com Marengo's Michael Volkening puts up a shot defended by Johnsburg's Tanner Kreassig (left) and Joe Bein during the fourth quarter of the BNC East boys basketball game Tuesday, January 27, 2015 at Marengo High School. Marengo won, 62-47. 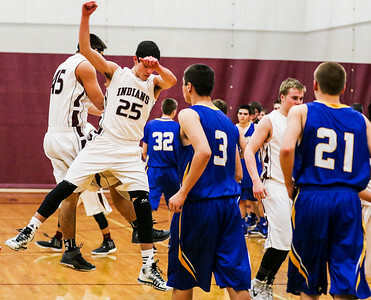 Kyle Grillot - kgrillot@shawmedia.com Marengo's Zach Knobloch (center left) celebrates with Dillon Csanda after beating Johnsburg in the BNC East boys basketball game Tuesday, January 27, 2015 at Marengo High School. Marengo won, 62-47. 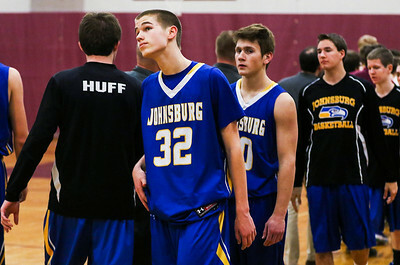 Kyle Grillot - kgrillot@shawmedia.com Marengo's Zach Knobloch (from left), Michael Volkening, and Koty Kissack, watch as the the BNC East boys basketball game against Johnsburg concludes Tuesday, January 27, 2015 at Marengo High School. Marengo won, 62-47. 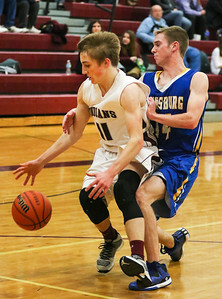 Kyle Grillot - kgrillot@shawmedia.com Marengo's Michael Volkening tries to recover the ball knocked from his hands by Johnsburg's Nick Whiting during the fourth quarter of the BNC East boys basketball game Tuesday, January 27, 2015 at Marengo High School. Marengo won, 62-47. 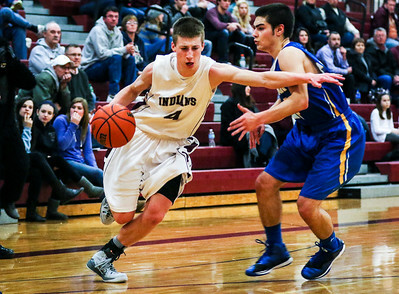 Marengo's Weston Shepard (left) dribbles towards the net defended by Johnsburg's Luke Lobermeier during the fourth quarter of the BNC East boys basketball game Tuesday, January 27, 2015 at Marengo High School. Marengo won, 62-47.